Mori Seiki MH-63 6-Pallet Cell 4-Axis CNC Horizontal Machining Center s/n 150 w/ Fanuc 11M Controls, 120-Station ATC (3-Banks of 40 Tools), CAT-50 Taper Spindle, 24 ¾” x 24 ¾” Pallets, Pallet Loading Cell, 4 th Axis Thru Pallets, Hand Wheel, Chip Augers, Chip Conveyor, High Flow Coolant. 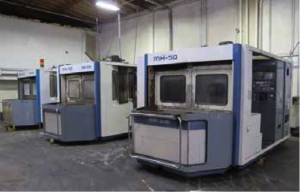 1994 Mori Seiki MH-63 2-Pallet 4-Axis CNC Horizontal Machining Center s/n 626 w/ Fanuc MF-M6 Controls, 60-Station ATC, CAT-50 Taper Spindle, 24 ¾” x 24 ¾” Pallets, 4 th Axis Thru Pallets, Hand Wheel, Oilmatic Oil Cooling Unit, Chip Augers, Chip Conveyor, Coolant. 1999 Mori Seiki MH-500 2-Pallet 4-Axis CNC Horizontal Machining Center s/n 978 w/ Mori Seiki MSC-502 Controls, 60-Station ATC, CAT-50 Taper Spindle, 19 ¾” x 19 ¾” Pallets, 4 th Axis Thru Pallets, Thru Spindle Coolant, Hand Wheel, Oilmatic Oil Cooling Unit, Chip Augers, Chip Conveyor, Coolant. 1997 Mori Seiki MH-500 2-Pallet 4-Axis CNC Horizontal Machining Center s/n 928 w/ Mori Seiki MSC-516 Controls, 60-Station ATC, CAT-50 Taper Spindle, 19 ¾” x 19 ¾” Pallets, 4 th Axis Thru Pallets, Thru Spindle Coolant, Oilmatic Oil Cooling Unit, Chip Augers, Chip Conveyor, Coolant. 1997 Mori Seiki SH-400 2-Pallet 4-Axis CNC Horizontal Machining Center s/n 343 w/ Mori Seiki MSC-518 Controls, Tool Presetter, 40-Station ATC, CAT-40 Taper Spindle, 15 ¾” x 15 ¾” Pallets, 4 th Axis Thru Pallets, Hand Wheel, Oil Cooling Unit, Chip Augers, Chip Conveyor, High Flow Coolant. 1997 Mori Seiki SH-400 2-Pallet 4-Axis CNC Horizontal Machining Center s/n 296 w/ Mori Seiki MSC-518 Controls, 40-Station ATC, CAT-40 Taper Spindle, 15 ¾” x 15 ¾” Pallets, 4 th Axis Thru Pallets, Hand Wheel, Oil Cooling Unit, Chip Augers, Chip Conveyor, High Flow Coolant. 1996 Mori Seiki SH-50 2-Pallet 4-Axis CNC Horizontal Machining Center s/n 373 w/ Mori Seiki MSC-516 Controls, 60-Station ATC, CAT-40 Taper Spindle, 19 ½” x 19 ½” Pallets, 4 th Axis Thru Pallets, Hand Wheel, Chip Augers, Chip Conveyor, High Flow Coolant. 1994 Mori Seiki MH-50 2-Pallet 4-Axis CNC Horizontal Machining Center s/n 808 w/ Fanuc MF-M6 Controls, 60-Station ATC, CAT-50 Taper Spindle, 19 ¾” x 19 ¾” Pallets, 4 th Axis Thru Pallets, Hand Wheel, Oilmatic Oil Cooling Unit, Chip Augers, Chip Conveyor, Coolant. 1994 Mori Seiki MH-50 2-Pallet 4-Axis CNC Horizontal Machining Center s/n 761 w/ Fanuc MF-M6 Controls, 60-Station ATC, CAT-50 Taper Spindle, 19 ¾” x 19 ¾” Pallets, 4 th Axis Thru Pallets, Hand Wheel, Oilmatic Oil Cooling Unit, Chip Augers, Chip Conveyor, Coolant. 1993 Mori Seiki MH-50 2-Pallet 4-Axis CNC Horizontal Machining Center s/n 758 w/ Fanuc MF-M6 Controls, Tool Presetter, 60-Station ATC, CAT-50 Taper Spindle, 19 ¾” x 19 ¾” Pallets, 4 th Axis Thru Pallets, Hand Wheel, Oilmatic Oil Cooling Unit, Chip Augers, Chip Conveyor, Coolant. 1992 Mori Seiki MH-50 2-Pallet 4-Axis CNC Horizontal Machining Center s/n 704 w/ Fanuc MF-M6 Controls, Renishaw M17 Machine Interface, 60-Station ATC, CAT-50 Taper Spindle, 19 ¾” x 19 ¾” Pallets, 4 th Axis Thru Pallets, Hand Wheel, Oilmatic Oil Cooling Unit, Chip Augers, Chip Conveyor, Coolant. 1992 Mori Seiki MH-50 2-Pallet 4-Axis CNC Horizontal Machining Center s/n NA w/ Fanuc MF-M6 Controls, 60-Station ATC, CAT-50 Taper Spindle, 19 ¾” x 19 ¾” Pallets, 4 th Axis Thru Pallets, Hand Wheel, Oilmatic Oil Cooling Unit, Chip Augers, Chip Conveyor, Coolant. 1991 Mori Seiki MH-50 2-Pallet 4-Axis CNC Horizontal Machining Center s/n 660 w/ Fanuc MF-M4 Controls, Tool Presetter, 60-Station ATC, CAT-50 Taper Spindle, 19 ¾” x 19 ¾” Pallets, 4 th Axis Thru Pallets, Thru Spindle Coolant, Hand Wheel, Oilmatic Oil Cooling Unit, Chip Augers, Chip Conveyor, Coolant. 1991 Mori Seiki MH-50 2-Pallet 4-Axis CNC Horizontal Machining Center s/n 553 w/ Fanuc MF-M5 Controls, Tool Presetter, 120-Station ATC, CAT-50 Taper Spindle, 19 ¾” x 19 ¾” Pallets, 4 th Axis Thru Pallets, Thru Spindle Coolant, Hand Wheel, Oilmatic Oil Cooling Unit, Chip Augers, Chip Conveyor, Coolant.